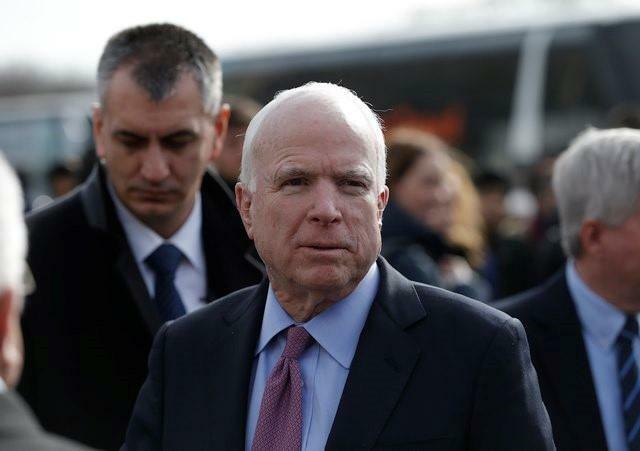 Republican U.S. senators John McCain and Marco Rubio won their party's nominations on Tuesday to seek re-election in Arizona and Florida in November, as both of the high profile politicians saw off insurgent challengers. McCain, the 2012 failed Republican presidential candidate, now faces a spirited challenge in Arizona from Democrat Ann Kirkpatrick, who has served in the U.S. House of Representatives since 2011 and wants to move to the Senate. McCain has said this year's race could be the toughest of a political career spanning more than three decades. In advancing to the general election, the 80-year-old McCain handily beat ex-state Senator Kelli Ward, 47, a conservative Tea Party activist and a follower of Republican presidential candidate Donald Trump. Like McCain, Rubio also is girding for a potentially tough challenge on Nov. 8. Also in Florida, U.S. Representative Debbie Wasserman Schultz overcame a challenger - and the embarrassment of being stripped last month of her job as head of the Democratic National Committee - and will get a shot at a seventh House term in the Nov. 8 general elections. She beat law professor Tim Canova, an outspoken Wall Street critic aligned with U.S. Senator Bernie Sanders. The non-traditional campaigns of Trump and Sanders, who exceeded expectations in his failed Democratic White House bid, spurred speculation that other insurgent politicians could make an impact this year. But that didn't happen in either of the closely watched nominating races in Florida and Arizona. Rubio, who abandoned his presidential campaign in March, cleared the initial hurdle in his battle for a second six-year term in the U.S. Senate. He defeated novice politician Carlos Beruff, a millionaire homebuilder, who embraced Trump. U.S. Representative Patrick Murphy, a Democrat, won his party's Senate nomination on Tuesday, and is expected to give g Rubio a tough fight, especially if Democratic presidential candidate Hillary Clinton leads Trump in Florida. There is speculation that Rubio might still harbor presidential ambitions after media reports this week that he had refused to commit to serving all six years of a Senate term if he were re-elected. Trump has endorsed McCain and Rubio in their re-election bids even though he has rocky relations with both. How McCain and Rubio far could have a big say in whether Republicans can defy expectations and maintain majority control of the Senate after November's election. "The balance of the Senate and the outcome of the presidential election are all hanging on Florida," Rubio predicted in a fundraising appeal late on Tuesday. Trump offended McCain and many other Republicans last year by suggesting the maverick senator was anything but a war hero because he was captured during the Vietnam War after his airplane was shot down during a bombing mission.